Who would have thought, that sweet potatoes would make such a good band name, that believe or not that's precisely what one band ended up doing for their namesake. 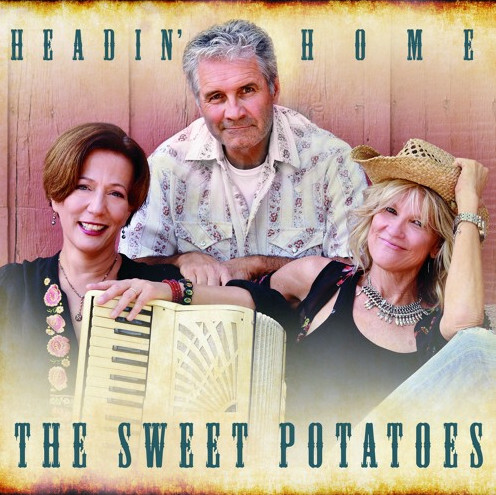 They went on calling themselves The Sweet Potatoes, with an album release titled "Headin' Home". A series of tracks spanning across a total of 12, takes you on a journey through the backside of the country lifestyle. Literally, this act of go getters combines the likeness of country, folk, bluegrass, bit of gospel with tang of Americana, is what you end up when listening to this album, and to the band in general really. Like for instance "Those Pines", which kicks off the album, really delivers you this energy of momentum, lots of polished harmonies with well written song writing, that captures the essence of all things Americana and good old country tunes. Another catching track would have to be "Second Hand News", as well as "Home", for each of these tracks, takes on a quality that's rich and care free. Really pulling on those heart strings, with such catchiness and upbeat tones, it makes up for the melodies pulsating outward, that your constant feet tapping will be long lasting through and through. Other notable tracks would likely be "Down To The River", "Our Front Porch", and "Little Red Robin", all of which really, continue that upbeat and catchy appeal, as the other tracks before these had done. But these selected are much more rounded, keep the music at a steady pace, but still make the material fun and entertaining throughout. Like when listening to these songs as a wholesome cycle, you can never get bored with them, they are just that right amount of fun and delightfulness, when listening in. That is really how "Headin' Home", plays out, for the most part, a series collection of tracks, that has a backing band to keep it all in check. That band being The Sweet Potatoes, an act that has got that good old country living feeling, that stays alive and well.